Last week was a busy week at the title companies as the 1st half of 2011 came to an end and Festivities for Independence Day started up. The million dollar question remains in every real estate market, when will the market "come back?" In the past few months, the inventory of available downtown lofts has been less than what we've seen in past years. A search for 2 bedroom, 1 bath spaces for less than $240,000 produced only 39 possibilities. Not what we're used to seeing. I double checked to make sure there wasn't a mistake. This year it seems that several great things are happening downtown that indicate a turnaround is on the horizon. A sweep of the Reds over at Busch Stadium would have been icing on the cake. 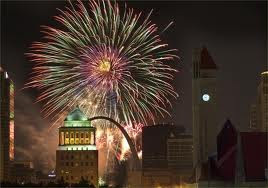 Looking at the numbers, there were 53 condos sold in downtown St Louis during the first half of 2011. That is based on Realtor sales on the MLS. Last year there were 41 sales in the first 6 months. While the median sale price dropped by about $20,000. From the Realtor perspective, it seemed like seller's in this years market seem to realize what they're up against more than in years past. One big factor in the increased sales this year also was the failure of Premier Bank of Jefferson City, the owner of the remaining lofts at the Dorsa. That change of the guard made the prices of these attractive units drop substantially overnight. As of today, the building is 90% Sold. The FDIC doesn't mess around when it comes to unloading property. Other foreclosures still pop up, and some are ridiculously priced. One would think that in this market, getting multiple offers on a property in less than a week wouldn't occur, but it does when a foreclosure agent prices a condo $50,000 to $100,000 below market, that happens. Despite the number of distressed sales taking place in all areas right now, it seems that compared to 2009 and 2010, there are more loft buyers that are interested in buying a place on more factors than just price alone. I had a conversation with one agent earlier this year about how her listing was substantially overpriced. It was! It didn't matter though, someone scooped it up for nearly $180 per square foot. Most seller's aren't that lucky, but just seeing it start to happen is reasurring that prices are beginning to stabilize. Considering the inventory is lower and only the 24 Grace Lofts have been added to the number of available condos in the past 4 years, we may start to see a housing shortage again downtown; the condition we were in back in 2005 when pricing began to spike. Lastly, one thing has continued to drag pricing down, which is the number of non-warrantable condos in the downtown area. Some of these were non-warrantable from the beginning, and others became non-warrantable when developers chose to rent out unsold inventory or some other factor. Lofts in buildings like Ely Walker, Ventana, Packard Lofts, King Bee, or Ballpark Lofts have been unable to entertain anything except cash offers; they've been sold for the lowest prices of all.